Sri Lanka's entrance into Test cricket ended in defeat inside four days, but they did more than enough to show that they would not be out of their depth with the big boys. Apart from the frustration when, in three-quarters of an hour, John Emburey destroyed their hopes with a spell of 5 for 5, the only disappointment of a long-awaited moment in the island's history was the smallness of the crowds. On only two of the four days was the 25,000-capacity ground even three-quarters full, this being variously attributed to high admission prices, television coverage and, disturbingly, the public's preference for one-day cricket. The consequence was a saddening lack of atmosphere, except briefly on the fourth morning when Sri Lanka, 160 ahead with seven wickets standing on a turning pitch, seemed to have the makings of a winning score. Ultimately, both the batting and the spin bowling failed to rise to the occasion. The two ODIs were close, England winning the first by five runs and Sri Lanka the second. Sri Lanka's first Test at Lord's was a great success for them, and although they did not win, they gained a first-innings lead of 121 and had the better of a drawn game. Put in by David Gower, on a morning when the ball was expected to swing, they were still batting two days later, by when Sidath Wettimuny had made 190, the highest score by anyone on his first Test appearance in England, and the Sri Lankan captain, Duleep Mendis, had raced to a hundred in only 112 balls - he came within 6 runs of making a second century. Again tacked on at the end of a long West Indies tour of England, this time Sri Lanka were well beaten in the one-off Test at Lord's. At all times they played with great enthusiasm. However, they were often troubled by injuries and illness, and the poor summer did not help them either come to terms with English conditions or gain the match practice they needed so badly. In the Test they never recovered from being put in and bowled out for 194, losing by seven wickets. The sole ODI was a closer affair, but as had been the case all tour, the Sri Lankan batting was good but the bowling lacked penetration and depth. Once more Sri Lanka had to make do with one Test at the end of the summer - and not even an ODI - but had it not been for a superb 113 not out from Alec Stewart, made almost entirely with middle and late-order partners, they would have taken a first innings lead. As it was they were left chasing an almost impossible 423 and they were spun to defeat by Phil Tufnell. England, who had not returned to Sri Lanka for 11 years, showed how much had changed in that time. After a disastrous tour of India, there was no respite on what was expected to be the easier leg of the trip. In the one-off Test England's bowlers lacked penetration and Sri Lanka's spinners took 15 wickets. The Test was sandwiched between two one-day internationals where England's batting was once again woefully inadequate. Sri Lanka came to England as world champions, and were handed a pitch at The Oval which could almost have been tailor-made for Muttiah Muralitharan. England were livid, and barely concealed it in the build-up for the match. The tense atmosphere was added to my comment from David Lloyd, the England coach, questioning Muralitharan's action. Arjuna Ranatunga won the toss and put England in on a good track - his reasoning was that he did not want to have to make them follow on, and was confident his batsmen would outscore anything England made. He was right. Sanath Jayasuriya blasted 213 and Aravinda de Silva caressed 152, and England, 148 behind, were clueless as Muralitharan took 9 for 65, 16 for 220 overall, in a ten-wicket win. Sri Lanka also beat England in the final of the triangular one-day tournament after losing to them in the qualifying round. England arrived in Sri Lanka buoyed by a stirring win in Pakistan two months earlier, and the series was billed as being all about how England would cope with Muralitharan. Although he took 14 wickets, they cost 30 each and his strike rate was a wicket every 101 balls. Murali did not bowl badly, but after Galle, his colleagues did not provide the weight of runs to bowl against and, as importantly, the tourists developed a strategy to negate his wiles. As Nasser Hussain explained, their method was to "pad him or hit him". The series was overshadowed by some on-field unpleasantness as relations between the side deteriorated. The umpiring contributed to the ill-feeling. At Galle it was bad, but did not affect the outcome as Marvan Atapattu's 201 set up an innings win. But at Kandy local umpire BC Cooray had a shocker. Most errors favoured England, and banners appeared telling Cooray his British visa was ready at the High Commission. England won a tense, low-scoring and acrimonious match by four wickets. The decider at the SSC was again low scoring, but seemed to be decided when Sri Lanka were skittled for 81. Set 74 to win, England were made to battle for every run, and Graham Thorpe's unbeaten 32 was vital as they edged home by four wickets. The one-day series that followed was anti-climactic as England were spent after two nail-biting Test series but Sri Lanka gained some revenge with a 3-0 clean sweep. In their 21st year as a Test-playing nation, Sri Lanka's adulthood was finally recognised with the present they most wanted: a first full tour of England. But the party hardly got going at all. They were without Muttiah Muralitharan for the first part of the tour; when he did arrive, they lost the last two Tests comprehensively. England played so well that a 2-0 victory did not flatter them, but Sri Lanka certainly helped gift-wrap it. And the whole thing was con-ducted in the shadow of a bigger, better jamboree - the football World Cup. Failure to reach the final of the triangular one-day series compounded an unhappy tour, which was in total contrast to the giddy, all-conquering stopover in 1998. When Sri Lanka's coach, Dav Whatmore, said at the end, "I've seen some positives but we haven't got what it takes to win abroad," only the first bit was debatable. It was a tour of three distinct parts. Sri Lanka started like a side counting the days until Murali recovered from a dislocated shoulder, rallied briefly to dominate the drawn First Test without him, and then, when he was back in the side, played just as the book says subcontinental sides should in an English May and June. They didn't win a single first-class match, not even against British Universities. Michael Vaughan's first series defeat as England captain was his last until the tour to Pakistan two years later, which demonstrated how quickly the mistakes on this trip were absorbed and rectified by an England team still in the throes of transition. Attempting to emulate Nasser Hussain's famously attritional approach, Vaughan's tactics proved to be unnecessarily timid, and England had backed themselves so far into the corner that they had expended all reserves of energy by the time the decisive third Test came along. At Colombo, they lost by an innings and 215 runs - their third-biggest defeat in history - as the peerless Muttiah Muralitharan finally twirled through their defences. England had saved the first Test at Galle in memorable fashion, and got out of jail thanks to Vaughan's hundred in the second, but there was to be no third-time lucky on this occasion. Despite defeat to Pakistan during the winter, English cricket was still on a high from their Ashes success the previous summer and Andrew Flintoff had made a positive early impression as captain of a young side which drew 1-1 in India. However, they were brought back down to the earth by a spirited and well-led Sri Lankan unit. All appeared to be going to plan during the opening Test at Lord's as England enforced the follow-on after dispatching Sri Lanka for 192 in reply to their 551 for 6 dec. Then Mahela Jayawardene led one of his great rearguard efforts, his 119 helping the tourists bat out 199 overs and force a draw. Flintoff bowled 51 overs, a decision that would later come back to haunt him. But England got back on track at Edgbaston with an efficient six-wicket win where Kevin Pietersen's breathtaking 142 off 157 balls was the highlight and an enthralling battle with Muttiah Muralitharan. Holding a 1-0 lead, England were not impressed when they turned up at Trent Bridge to be greeted by a bare, dry wicket. The warning signs flashed as Muralitharan took three to hand Sri Lanka a narrow first-innings lead, which had been extended to 325 on the fourth day. Muralitharan then produced a magical performance, taking 8 for 70 eight years after his famous 16-wicket haul at The Oval. But if a drawn Test series was bad enough for England, the one-day contest turned into a nightmare. They barely put up a fight as Jayawardene scored back-to-back centuries. England's nadir came in the final match when despite amassing 321 they lost with more than 12 overs to spare. Steve Harmison conceded 97 off 10 overs, the most expensive figures by an England bowler in ODIs. This was a series dominated by Muttiah Muralitharan's world-record 709th Test wicket on his homeground in Kandy and he played a key role in Sri Lanka's 88-run victory which was clinched in the dying moments. Matt Prior, who endured a difficult time with the gloves, hit 63 and Ian Bell 74 in more than five hours to take England to the brink of a draw. 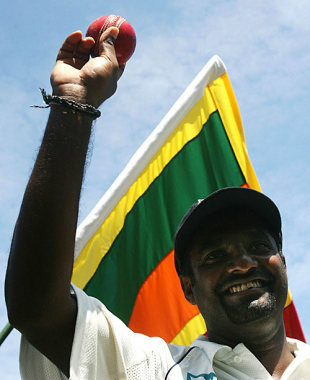 Muralitharan, though, wasn't going to be denied and removed them both leaving the bowlers too much to do. It was a fine turnaround after Sri Lanka had been 42 for 5 on the first morning. Having failed to save the game England looked deflated for the rest of the series and couldn't build on their occasional moments of dominance, such as an opening stand of 133 in Colombo. Mahela Jayawardene hit a marathon 195 but England comfortably saved the second Test with the help of a little rain, although they needed much more help from the elements in the final match. Jayawardene continued his sublime form with 213 and England were skittled for 81 in reply. A 2-0 series loss looked certain until the Galle rain arrived over the final two days and took out just enough time to save England. Alastair Cook played his part with a battling hundred, but there was a chasm between the sides. This, though, had been a split tour and in the one-dayers a month earlier the honours had gone, famously, England's way with a 3-2 victory. It would prove the highpoint of Peter Moores' troubled stint as coach as the tourists won the middle three matches with a combination of impressive bowling, sharp fielding and gusty batting. A Sri Lankan team shorn of past greats Muttiah Muralitharan and Chaminda Vaas was expected to be blown away by an England side in some of the best form in their history, having just reclaimed the Ashes down under. But Sri Lanka would have held England in a largely rain-affected Test series were it not for the most dramatic of collapses on the final afternoon of the first Test in Cardiff. Play didn't begin until after lunch on day five with England batting in their first innings. They added five runs to allow Ian Bell to score a hundred before declaring 96 ahead. Sri Lanka were then blown away after tea by Chris Tremlett and Graeme Swann as England took 25 overs to bowl out the tourists for 82 - their fourth lowest score in Tests. But they battled back and big scores from captain Tillakaratne Dilshan, 193 in the second Test at Lord's, and veteran Kumar Sangakkara, 119 in the third Test at Southampton, rescued draws. The one-day series was Alastair Cook's second as England captain, the first was against Bangladesh, and he led from the front with almost 298 runs at 74.50. Cook made 119 in England's defeat at Lord's that put Sri Lanka 2-1 up and made 95 not out as England levelled the rubber in the next match with a 10-wicket win at Trent Bridge. It set up a series decider at Old Trafford and England defended 268 to take the series. A short tour of just two Tests was shared with England producing two vastly contrasting performances, the second of which proved they could prosper in Asian conditions after all. They arrived having being thumped 3-0 by Pakistan in the UAE and were now clinging onto their World No. 1 Test ranking by their fingernails. Huge doubts hung over their ability to play spin following their miserable time against Pakistan and those doubts were only encouraged when they lost the first Test in Galle, where a turning pitch was predictably unveiled, by 75 runs. Mahela Jaywardane's 180 almost single-handedly presented Sri Lanka with a stable first innings of 315 after which England succumbed to the turning ball. The most galling thing from England's perspective was they were not conjured out by mystery spin or the brilliance of a great tweaker but by the relatively mundane slow left-armer, Rangana Herath, who took 12 wickets in the match. England had their chances: Jayawardene was dropped three times in the first innings. But Sri Lanka, with a lead of 125, set England 340 as Graeme Swann struck back with six wickets. Despite Jonathan Trott's century, the chase was in vain. Few gave much for England's chances when they headed to Colombo, and the P Sara Stadium, in the heat of early April. A century from Jayawardene once again gave Sri Lanka a stable first-innings score, but finally England's spin-phobic batsmen gave their put-upon bowling attack some support. This time England's top three scored heavily, setting up the opportunity for Kevin Pietersen to produce one of his finest Test innings - a spectacular 151 from 165 balls, his highest Test score in Asia, and an innings possessing the freewheeling mood of his youth. It took England 118 overs to dismiss Sri Lanka a second time - the admirable Jayawardene finally silenced by Swann on his way to ten wickets for the second time in Tests. England gambolled to an eight-wicket victory on the final afternoon, and narrowly retained their No 1 ranking as a consequence. The two-Test series was packed with enough drama for a five-match epic. Sri Lanka sealed an historic first series win in England off the penultimate ball of the second Test at Headingley when No. 11 James Anderson fended Shaminda Eranga to short having survived 54 deliveries alongside a defiant Moeen Ali who scored his maiden Test hundred. Anderson was in tears at the post-match presentation and it was a result that pushed Alastair Cook close to resignation, following as it did the Ashes whitewash down under and England's near-miss to win the opening Test at Lord's. That had final-over drama, too. Sri Lanka were eight down with Stuart Broad steaming in from the Nursery End and with the first ball Rangana Herath gloved a bouncer (although replays would show his hand off the bat). Broad then had five balls at No. 11 Nuwan Pradeep - who had fallen into his own wickets in the first innings - and he came within a DRS call of winning the match when Pradeep was lbw to the penultimate ball only to have got a thick inside edge. The last ball of the match was then edged agonisingly short of the slips. It had been a bat-dominated match as Joe Root made a maiden double hundred, on his return to the side after being dropped at the end of the Ashes series, and Gary Ballance a maiden Test century while Kumar Sangakkara and Angelo Mathews also made tons. It was Mathews who would play the defining innings of the series at Headingley with a career-best 160 as he and Herath added 149 for the eighth which left England needing 350. Dhammika Prasad took a five-wicket haul to put Sri Lanka on course but it was left late. In a change to the schedule, the T20 and ODIs had been staged first. The one-dayers ended in controversy when Jos Buttler was mankaded by Sachithra Senanayake at Edgbaston as Sri Lanka clinched the series. The game before Buttler had smashed England's then fastest ODI hundred off 61 balls but he could not quite haul England to a chase of 301.